This happened to me last Wednesday. It was a day so bad I can scarcely speak of it now, 4 days later. My mother told me this is one of those days I'm going to laugh about someday. Last Wednesday also happened to be my first blogiversay. I was supposed to be celebrating my love for pastry and heavy cream, but instead I spent most of it in meltdown mode, in tears over spilled cake. A little ironic, yes, but, as any food blogger would tell you, sometimes that's just how it goes. I had originally set out to create a very elaborate meringue cake for you to celebrate one year of blogging. I prepped everything the night before and set out to assemble it in the morning. It was gorgeous. Stunning. Delicious. As I was wiping the last bit of stray chocolate from the cake stand to take photographs, it happened. The entire cake stand toppled over. I don't know how. I don't know why. I managed to catch the stand before it hit the table, but it was too late. The meringue collapsed, the layers slid, and 1/3 of the cake was sitting on the table. A few choice words were said. I was upset. It was my blogiversary. I needed to share something with you! It wouldn't be a blogiversary without cake! In my stubborn fit of rage, I got in the car, drove to the nearest kitchen store, and bought myself a new cake stand. I went to the grocery store and bought more ingredients. Then I went back home and I spent the next four hours baking that damn cake. Again. As I was assembling it, the bottom layer collapsed on one side. I sucked in my breath and tried to fix it up the best I could. It would have to do. After getting everything in place for the second time, I stood back to admire my work. You won't believe what happened next. I still don't believe what happened next. What happened next isn't even physically possible. It had become the Virgin Mary of cakes; I didn't even need to cry because my cake was crying tears of frustration for me. Sad, clear tears ran themselves down the sides of the cake. They pooled in the bottom of the cake stand, creating a puddle of misery. The layers weeped themselves right off the cake. To put it simply, I had a meltdown. It wasn't pretty. Over $40 of cake was lying on the table or dripping onto the floor. My kitchen was an absolute disaster. And I still didn't have anything to share with you. I had another four failed desserts that day. You can call me persistent. You can admire my determination. But, as it so happens, I just don't know when to throw in the towel. If there was any doubt before, you now know that I am undeniably not immune to (multiple) kitchen failures. In this case, I think it's safe to say that when life give you lemons... make lemonade. 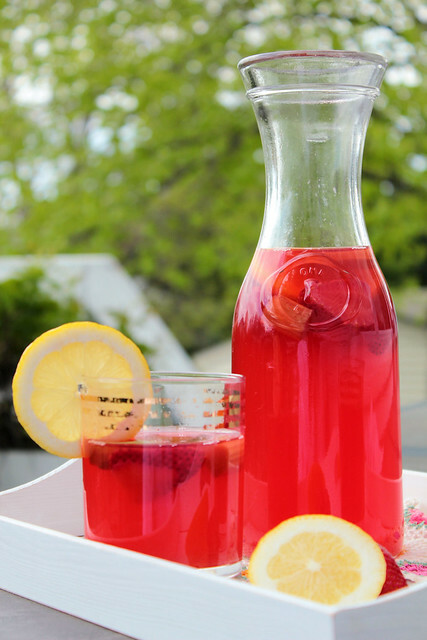 This strawberry rhubarb lemonade, however, is definitely not a kitchen failure. It is so light, intense, and unbelievably fruity. I had to stop myself from drinking the entire two quarts in one sitting. 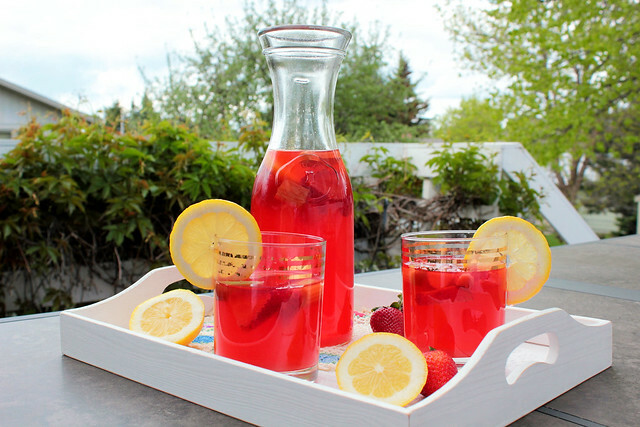 The strawberry notes in this lemonade really stand out. The sweetness of the strawberries is cut by the tartness of the rhubarb, creating this wonderful blend of flavors. 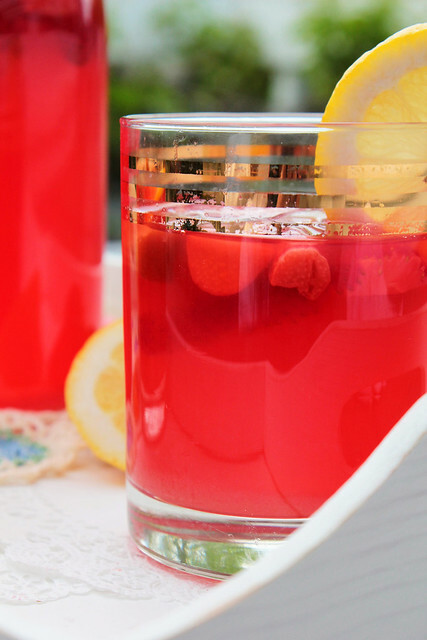 This lemonade is such a bright, bold color that you just might find it difficult to look away. This is a drink you don't want to miss. In a large saucepan over medium-high heat, boil rhubarb, strawberries, sugar, and water. Once boiling, reduce to a simmer and cook for 20 minutes. Strain the mixture through a fine-mesh sieve and cool in the refrigerator. Once cool, add the lemon juice. 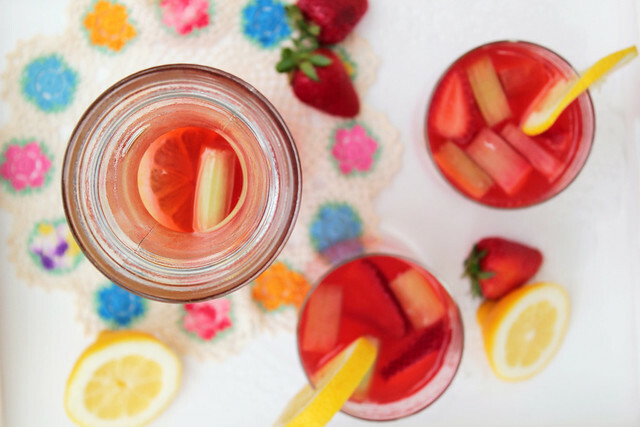 Garnish with lemon slices, rhubarb, and sliced strawberries. Enjoy!